Mystique games have a grid pattern against a solid background with some game related artwork in the middle. The Mystique name and game title appear on the main label, and the name is repeated again on the end. 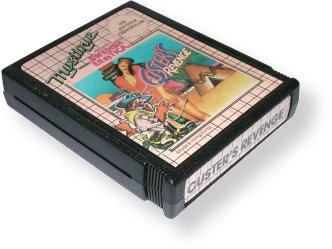 Mystique packaged their games in oversized gatefold boxes, inside which was a fake leather case that held the cartridge. There was even a lock and key to keep the youngsters from playing mom and dad's game.